SOLD Owl and Athena Tetras Pendant; Please Explore Our Greek Pendants For Similar Items. 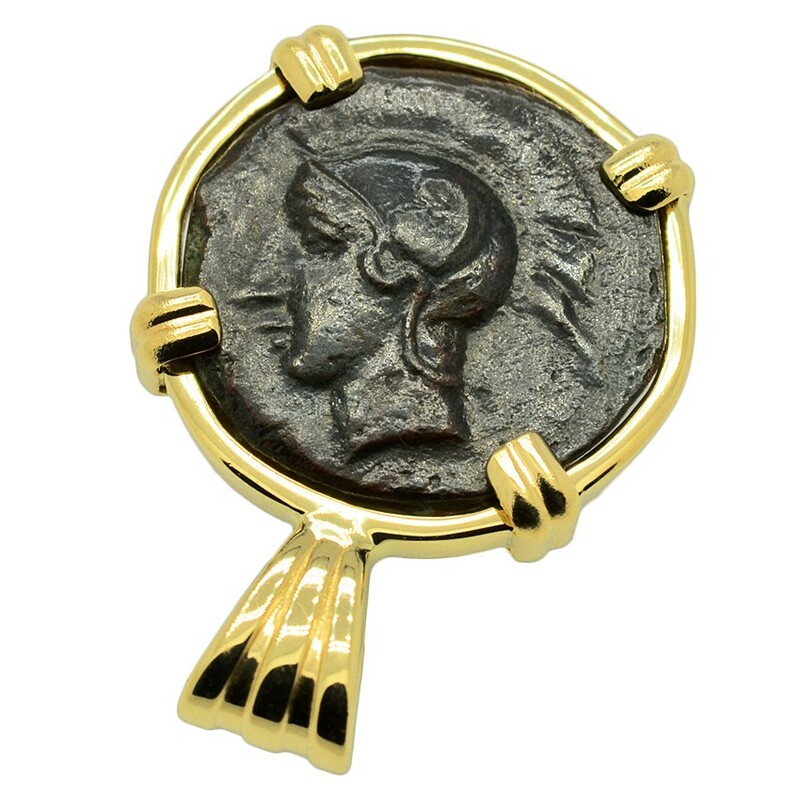 This coin was minted in the 5th century BC in the ancient Greek city of Camarina, located on the southern coast of Sicily. Camarina was founded by the great city of Syracuse in 599 BC, but was destroyed by the mother city in 484 BC. The city was re-colonized from nearby Gela under the Olympic charioteer champion, Psaumis of Camarina and grew rapidly until it was sacked by Carthage in 405 BC. Camarina endured until 258 BC, when the city fell to the Romans during the first Punic War. 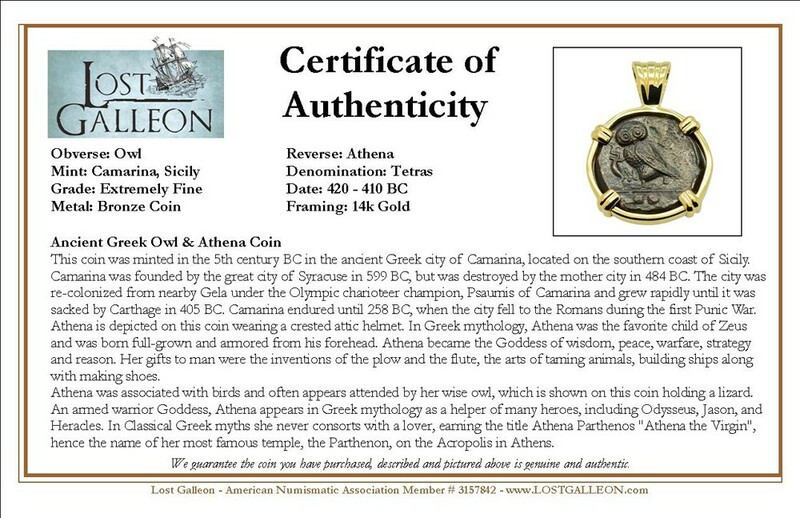 Athena is depicted on this coin wearing a crested attic helmet. In Greek mythology, Athena was the favorite child of Zeus and was born full-grown and armored from his forehead. Athena became the Goddess of wisdom, peace, warfare strategy and reason. Her gifts to man were the inventions of the plow and the flute, the arts of taming animals, building ships along with making shoes. 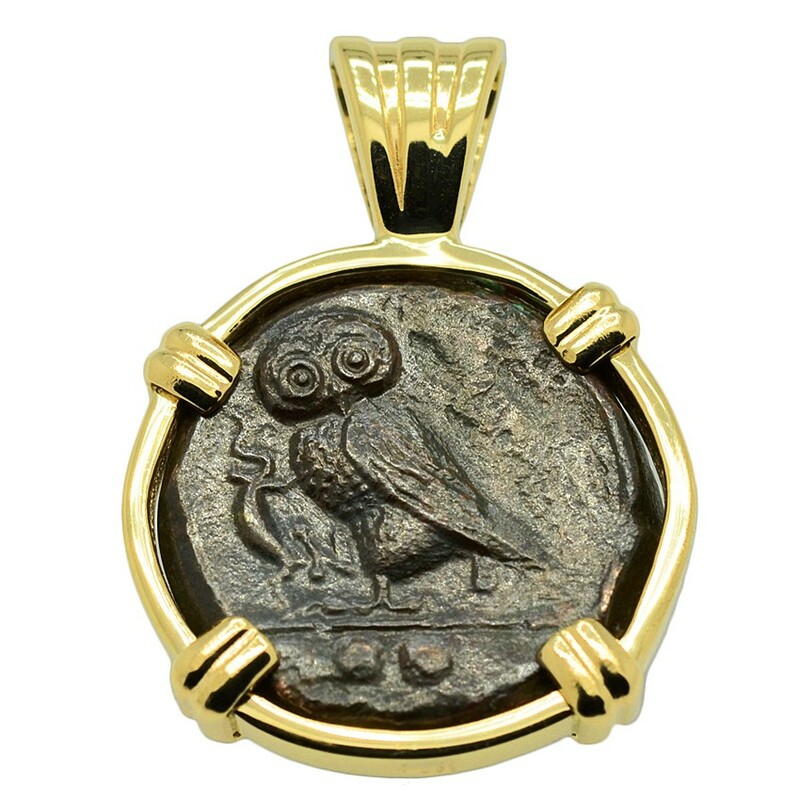 Athena was associated with birds and often appears attended by her wise owl, which is shown on this coin holding a lizard. An armed warrior Goddess, Athena appears in Greek mythology as a helper of many heroes, including Odysseus, Jason, and Heracles. In Classical Greek myths she never consorts with a lover, earning the title Athena Parthenos "Athena the Virgin", hence the name of her most famous temple, the Parthenon, on the Acropolis in Athens.